Panasonic Arc 3 vs Arc 4 vs Arc 5: Which One Should You Buy? Panasonic is alongside Braun and Philips Norelco the third major player on the electric shavers market. With a rich history behind, Panasonic gained a reputation for manufacturing high-quality foil electric shavers. However, Panasonic never achieved the same popularity as Braun and Norelco on the North American market; Norelco’s brand equity and the aggressive marketing of P&G — the parent company of Braun — have definitely played an important part here. And that’s really a shame as in my opinion the quality and performance of some Panasonic electric shavers are at least as good as the ones from the competition. Most of Panasonic’s current offerings can be grouped into 3 categories: the Arc 3, Arc 4 and Arc 5 lines of electric shavers. Covering everything from entry-level to high-end shavers, with both older and newer models available that bring significant or minor improvements over the previous iterations, it can get difficult to go through all the fluff and find a shaver that will suit your needs. In this post we’ll cover in great detail all the differences between the Arc 3, Arc 4 and Arc 5, see how they compare against each other and if the added features of the more expensive models are worth the extra money. By the end of this article you’ll have a clear picture of all the different models, variations and their performance. Moreover, you’ll know if a certain model would be suitable in your case or you’ll be better off spending a little more on a more advanced shaver. Let’s dive in and check out the things that really matter in this Panasonic Arc 3 vs Arc 4 vs Arc 5 comparison. Note: this is a very comprehensive comparison, so you might want to use the table of contents below to jump straight to the section that interests you the most. Automatic cleaning stations — should you get one? Arc 3 vs Arc 4 vs Arc 5: which one should you choose? The Arc term was introduced by Panasonic in 2008 when the first models featuring an arched profile of the shaving head were launched. Two Arc 4 shavers with the trademark arched shape of the foils. This new design gradually replaced the older generation shavers that featured a classic, straight edge foil. 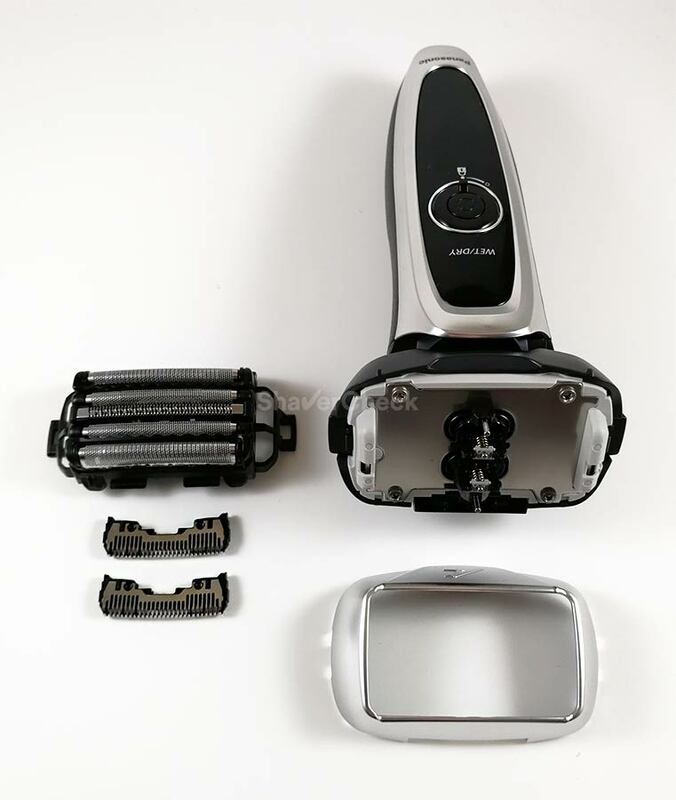 The 3, 4 and 5 designate the number of individual cutting elements that a particular shaver has. While more doesn’t always imply better, the Panasonic models with more blades usually have better performance, faster motors and nicer features (more on this later on). 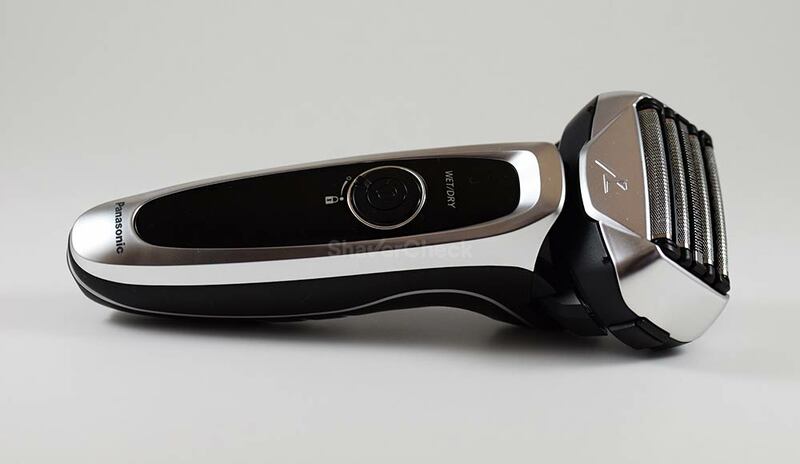 The Arc 3 is, as the name suggests, Panasonic’s line of electric shavers that have a 3 blade shaving head and represent the company’s entry-level shavers. Their direct competitor is Braun’s Series 3 line. You can check out a detailed comparison of the two here. Since the Arc 3 was first introduced, the lineup has seen quite a few updates, some of them minor, other significant and almost all the various models are still widely available. The differences are poorly documented and the model names don’t make any sense at all. With that said, here’s what you need to know if you decide to buy an Arc 3. The motors fitted to the various models are different. Most of them feature very powerful 13 000 CPM (cycles per minute) units. However, there are a few variations that have 7600 or 10 000 CPM motors, like the ES-SL41-S or the ES-ST25-S respectively. Stay away from those as the performance drop is significant compared to the 13 000 CPM models. The updates rolled out by Panasonic between 2008 and 2014 are minor for the most part, consisting of visual makeovers or different materials used. The performance has remained pretty much consistent. 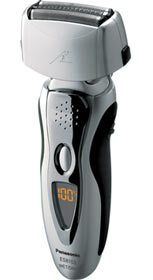 As long as you opt for a shaver fitted with a 13 000 CPM motor like the ES8103S or ES-LT41-K you’re all good. The first major update to the Arc 3 family occurred with the introduction of the LT Arc 3 shavers in 2016. This represents a rather big step forward in terms of build quality and design, but not that significant performance-wise. However, these new Arc 3 models are currently quite expensive for what is (at least in theory) Panasonic’s budget-oriented line of shavers. More on this in the performance section. 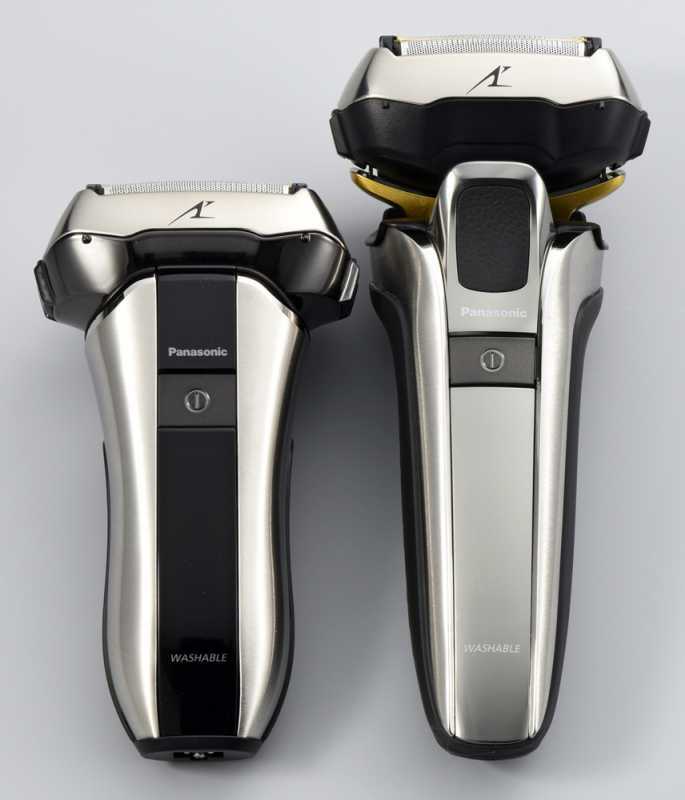 Positioned right between the Arc 3 and Arc 5 in terms of price and performance, the Arc 4 represents Panasonic’s mid-range family of foil electric shavers. At the time of their launch back in 2011, the Arc 4 had a premium price tag which was probably one of the reasons why it didn’t take off. For just a few bucks more you could get one of the flagship Arc 5 models. However, the price has dropped significantly since then and you can currently find some Arc 4 shavers at bargain prices. With 4 individual cutting elements, powerful 13 000 or 14 000 CPM motors and solid performance, the Panasonic Arc 4 shavers are a very compelling option. There are 4 variations in the Arc 4 family, all of them offering similar performance. For an in-depth comparison of the most popular Arc 4 models, make sure to check out this post I wrote a while back. My personal pick would be the ES-LA63-S or ES-LF51-A that come with powerful 14 000 CPM motors and can usually be bought at a very reasonable price. 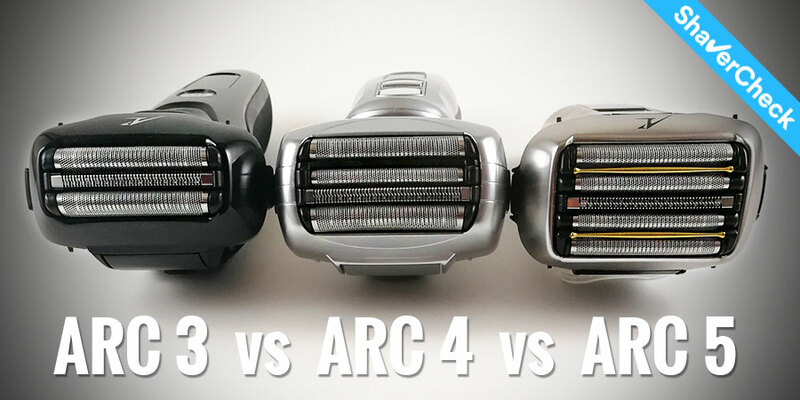 Unlike the Arc 3, the Arc 4 line hasn’t seen any updates since it was launched, which makes picking a shaver a lot easier. The Arc 5 is the expression of Panasonic’s more is better mantra. Featuring a whopping 5 individual cutting elements, the Arc 5 is in a league of its own as no other foil shaver, not even Braun’s Series 9 flagship, can’t match this number. The Panasonic Arc 5 electric razors were first introduced in 2009 and have seen two major updates until the present day. As a result, there are 3 generations still widely available for purchasing and again, their differences can be pretty difficult to spot and to asses. The first (original) generation Arc 5. 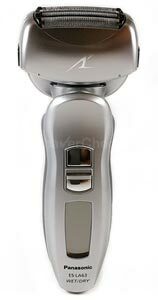 The first shavers were launched in 2009 and were represented by the ES-LV61-A or the ES-LV81-K models. The two are identical, except for the color scheme and the fact that the second one includes an automatic cleaning station. The cleaning station is the older Vortex Hydra model that uses detergent cartridges and was later replaced by a new one with the introduction of the second generation Arc 5. While you can sometimes find these models at excellent prices, they’re usually more expensive than the newer Arc 5 shavers and are getting more difficult to find, so my recommendation would be to skip the first generation altogether. The second generation Arc 5. Released in 2013, the second update of the Arc 5 line brought a new modern design, better build quality, and a completely redesigned cleaning station. In this second generation we have shavers like the ES-LV-65-S (no cleaning station) and the ES-LV-95-S (automatic cleaning station). The third generation Arc 5. The latest iteration of Panasonic’s range-topping shavers was launched in September 2015 and represents a complete departure from the older shavers in terms of design and build quality. With a premium metal body (on the more expensive models) and a redesigned shaving head that now features two comfort rollers, the latest Arc 5 shavers are some of the best performing foil shavers you can currently buy. The shaving head of the latest generation Arc 5 shavers with the two golden comfort rollers. The third generation Arc 5 shavers available on the American market are the ES-LV6N-S (no cleaning station) and ES-LV9N-S (cleaning station), but they are identical to the international models (ES-LV6A-S, ES-LV9A-S respectively). I personally wouldn’t worry too much about the improvements of the B revision models as the actual shaving performance won’t be improved in a significant manner. The price should be the only decisive factor in this case. In 2017 and 2018 respectively, the revisions C and D of the Arc 5 were launched and these are also available on the Asian and European markets. This time the differences are a bit more nuanced, but again the actual shaving performance isn’t too different from the previous iteration. More details in this post. The novelty of the revision C is a compact Arc 5 model, namely the ES-CV51 (ES-CV70). It’s a high-performance electric shaver that comes in a very compact form factor. Now that we’ve cleared up some of the confusion regarding the various models in the Arc 3, Arc 4 and Arc 5 families, let’s see how they stack up against each other in certain key areas and which are the particular models in each line that offer the best performance for the money. Choosing an Arc 3, 4 or 5 should depend on your particular needs and goals, shaving habits and budget. So there’s no definitive answer as the shaver that represents the best option will be different with every situation. Shaving performance is what matters the most to someone looking to buy an electric shaver, so we’ll kick off this comparison with that. Let’s see how the different Panasonic shavers fare in each category. Most users would agree that foil shavers generally offer a closer shave compared to rotary razors. Furthermore, when it comes to the closeness provided by various foil shavers, it’s also commonly accepted that Panasonic is the best in this regard, even though not by a huge margin. Having used quite a few Panasonic shavers myself, I can safely say that I find this to be true as well. When it comes to closeness, Panasonic shavers really deliver. This is one of the main advantages of Panasonic shavers over the competition if not the most important one. And this is consistent throughout all the Arc models, even with the budget-friendly Arc 3 shavers (I will only be referring to the Arc 3 models that are fitted with the 13 000 CPM motors as they outperform the ones with the less powerful units by a large margin). Panasonic uses throughout their entire lineup their so-called 30 degrees nanoblades. These are the blades that oscillate behind the thin perforated foils and do the actual cutting. The inner 30 degrees nanoblades of an ES-LF51-A Arc 4 shaver. As you can see, there are only two removable inner blades, the rest of them being integrated into the foil assembly itself. This setup is common to all the Arc lines. 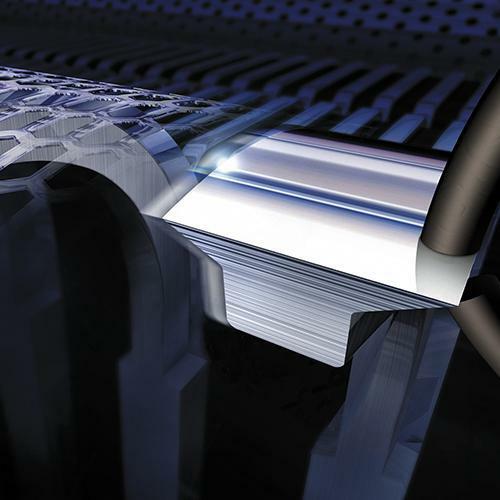 What differentiates Panasonic’s nanoblades from the competition is the aggressive 30 degrees bevel that ensures a very efficient cutting action. The Panasonic nanoblades with the 30 degrees bevel. A combination of high quality, sharp blades, arched foils that ensure optimal contact with the skin and powerful motors allows Panasonic Arc models to shave closer than pretty much any other electric shavers currently on the market. The Arc 3 with its 3 cutting elements is arguably the closest shaving affordable electric razor. The ES8103S Arc 3 for example is reasonably priced and one of the best-selling Panasonic shavers of all time. Compared to similarly priced models from the competition, like the Braun Series 3 or Norelco 6100, the Arc 3 is clearly better when it comes to closeness. The latest LT Arc 3 models feature a nicer design and can even come with the updated cleaning station (like the ES-LT7N-S). In terms of closeness, I haven’t found them to be better than the older models like the ES8103S or ES-LT41-K.
At least at the time of writing, the retail price of the LT models is pretty high in my opinion and the Arc 4 models offer better value for money and better performance. Speaking of which, the more advanced Arc 4 and Arc 5 with their 14 000 CPM motors and more shaving elements are even better than the Arc 3 for closeness, but not by a huge margin. This difference will be more obvious if you have a very coarse beard. The Arc 4 has an additional shaving element compared to the Arc 3 models — a finishing foil — that cuts hairs very close to the skin. The Arc 5 takes this to the extreme with an extra foil for a total of 5 active cutting elements. Overkill? Maybe, but the advantage of a massive shaving head is that it takes less time to complete a shave, even though the end result won’t be that much different. As it was expected, when it comes to closeness, you will see slight improvements as you go from the Arc 3 toward the latest Arc 5 models. In the case of very coarse, dense facial hair the improvements will be more obvious. The Arc 3 is perfectly suitable for shaving daily and an excellent budget-friendly option. If you have light to medium, even coarser hair, the Arc 3 would be a very good option. For coarser beards and even for shaving every other day, the Arc 4 is a better option and you will appreciate the extra cutting power. 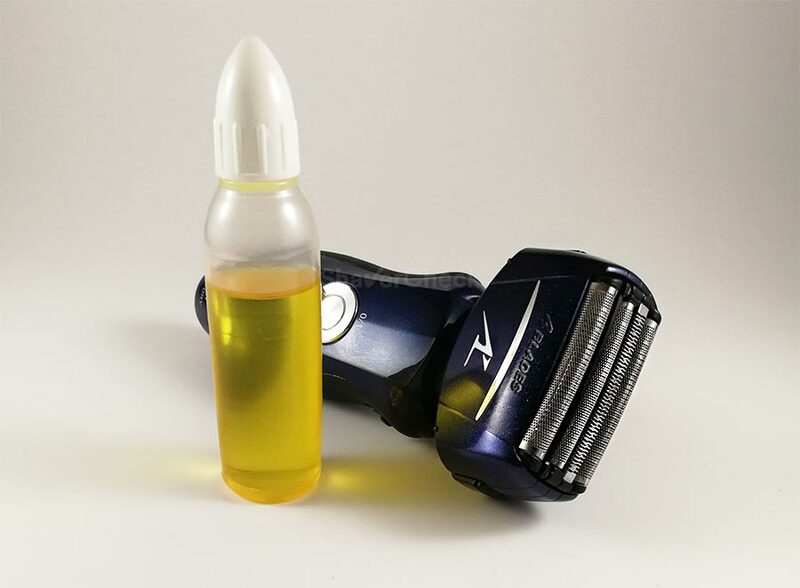 The Arc 4 provides this while still being reasonably priced and for these reasons I actually think the Arc 4 would be the best option for most men that are mainly concerned with getting a very close shave. The ES-LF51-A is my personal favorite; it has a 14 000 CPM motor and a slimmer shaving head compared to other Arc 4 models, making it easier to maneuver around tight spaces. 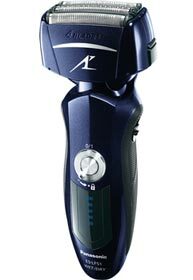 Finally, the 5 blade Arc 5 is the ultimate shaving machine if closeness is all you want. 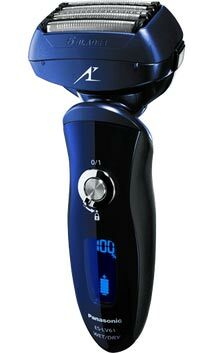 While it will offer diminishing returns compared to an Arc 4, it is a superior shaver. So which Arc 5 should you choose? I would suggest going for a second generation Arc 5 like the ES-LV65-S that I reviewed in great detail here. They don’t cost a whole lot more than an Arc 4 and are a definite improvement over the original models. They also have a superior automatic cleaning station (the ES-LV95-S variation). The latest (third generation) Arc 5 like the ES-LV6N-S and the ES-LV9N-S are currently Panasonic’s best shavers. While the closeness is pretty similar to the ES-LV65-S, they are more comfortable and even suitable for men with sensitive skin. If you don’t mind paying a premium price tag, they are some of the best performing electric shavers you can currently buy. However, the price is too high in my opinion and the improvements over the second generation are mostly in the build quality and comfort departments. 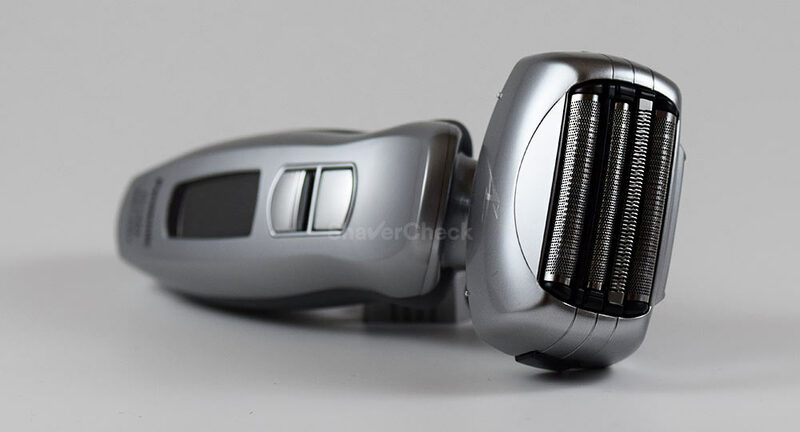 So if closeness is your priority, you can safely opt for a second generation Arc 5 like the ES-LV65-S.
Closeness aside, how comfortable and forgiving a particular shaver is should come high on your priority list. For the most part, Panasonic shavers are adequately comfortable and can even be an option for men with sensitive skin with some minor adjustments. However, there is a trade-off for that extreme closeness; they can be a bit aggressive if you press harder and the foils can get hot after prolonged use. There are various workarounds that can make Panasonic shavers more comfortable during use. Since almost all of them are suitable for wet & dry use, you can try shaving with cream, soap or gel. I personally find this to be an excellent compromise as I am able to get a very close shave with no irritation or razor burn. If the thought of using shaving cream is off-putting (and rightfully so), you can try using a pre-shave lotion or gel that should improve the dry shave performance and comfort. The shaving head of Panasonic shavers, particularly the middle trimmers, can get quite hot and cause discomfort. I’ve experienced this with several Arc 3 and Arc 4 models. One way to reduce the heat would be to always lubricate the cutting parts before your shave. This should be done with any electric shaver actually. Using an automatic cleaning station takes care of this, but if your Panasonic doesn’t include one then you should lubricate the blades regularly. So how do the Arc 3, 4 and 5 fare with regards to comfort? Which one is better? I would say that they are all pretty similar, with a clear advantage for the latest Arc 5 that feature comfort rollers. While it may seem like a gimmick, they reduce the friction and prevent you from pressing the shaver too hard into the skin which can cause razor burn. TIP: these new foils and blades are backward compatible with the previous generation Arc 5 models like the ES-LV65-S. If you don’t have very sensitive skin, you should be fine with either of the Arc 3, 4 or 5 provided that they meet your other requirements (closeness, features, and price). A quality shaving cream or pre-shave lotion can also help. If however you have blemish prone skin and constantly get razor burn then you might want to consider a Braun shaver as they are a better option in this case. A Series 7 or 9 would make good choices. When choosing an electric shaver you must also consider your shaving habits. Precisely, how often you shave. If you always shave daily, then you can get away with a more basic shaver, like the Arc 3. As I said previously, it is a perfectly suitable shaver for everyday use. Longer, flat-lying hairs are something most shavers struggle with. And this seems to be worse with foil shavers. Usually, the more advanced shavers that have specially designed elements to capture and cut longer, flat-lying hairs, fare a lot better. If you shave every other day or every two days then you should consider an Arc 4 or 5. Getting a smooth shave when you have longer, flat-lying hairs that grow in different directions will be more difficult and time-consuming. The extra cutting elements of the Arc 4 and Arc 5 will improve your results and the overall shaving experience, but only up to a point. Panasonic shavers are not the best for longer, wiry hairs. If you will constantly be in this situation you may want to consider other options like the Braun Series 9 which is in my opinion the best performing foil shaver when dealing with longer hairs. To sum it up, The Arc 3 is suitable for shaving daily or every other day at most (if you have a slower growth). For anything more than that, I suggest going for an Arc 4 or Arc 5. Or better yet, A Braun Series 9 that has two cutting elements specifically engineered for capturing longer, wiry whiskers. Cutting power and sharp blades are what it takes to complete a shave with ease. And Panasonic shavers have them. The massive shaving heads of the Arc 5 are able to cover large areas fast, while the sharp blades mow through the coarsest beards. Moreover, the shaving heads of the latest Arc 5 can even be depressed, supposedly helping to maintain constant contact with the skin even if you have very prominent facial features. 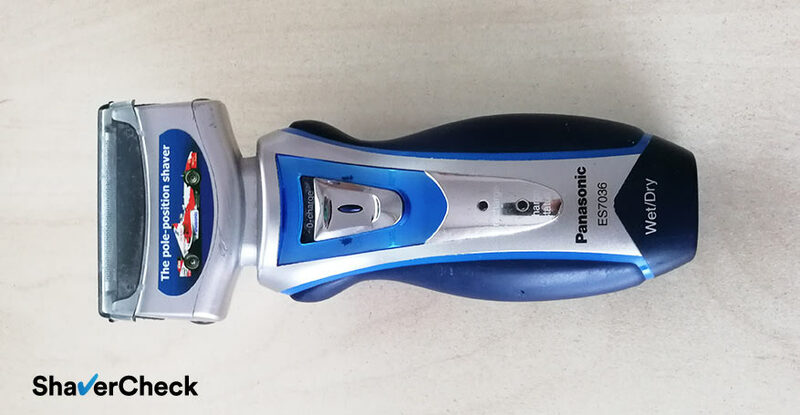 I would go as far as saying that the Panasonic Arc 5 will be able to complete a shave faster than any other electric shaver (provided your facial hair is not very long). 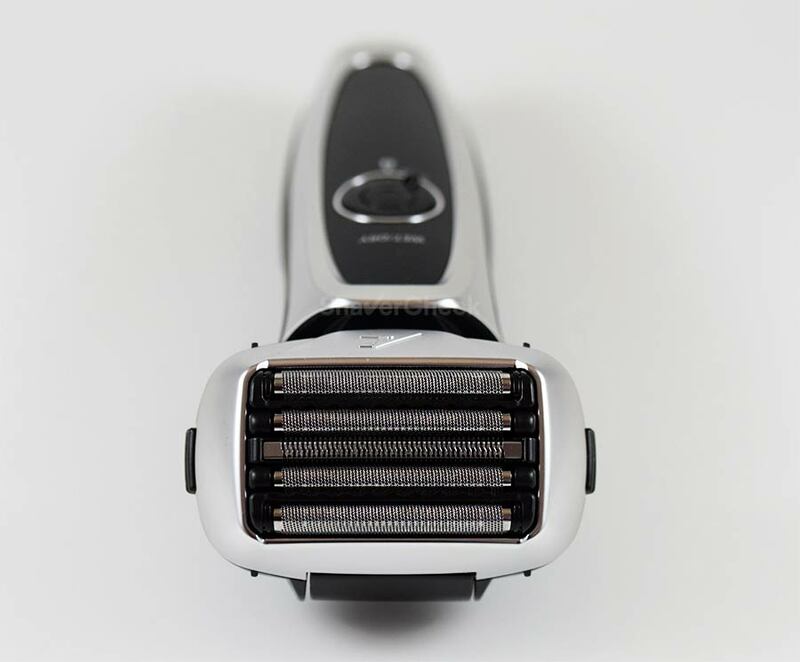 The Arc 4 is no slouch either and again will be faster than other similarly priced razors from the competition, like the Braun Series 5 and 7. AGain, assuming you beard is reasonably short. With only 3 cutting elements, the Arc 3 obviously falls behind the more expensive Arc 4 and 5, but again, its performance is more than adequate for the price. 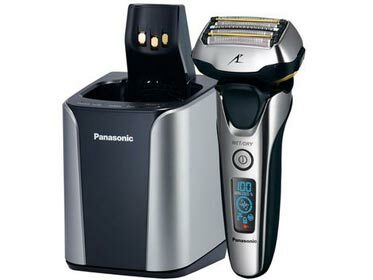 There’s no surprise here, if you want the fastest shave the Panasonic Arc 5 is the right choice. Again, I would recommend a second generation model, like the ES-LV65-S or ES-LV95-S that comes with an automatic cleaning station since their price has dropped significantly. Braun always had the spotlight for build quality and industrial design innovation, especially when considering the shavers from the Dieter Rams era. But Panasonic is right up there in my opinion; in fact, the durability and build quality of their shavers, particularly the more recent ones, are top notch. My old Panasonic ES7036, the straight foil grandfather of the Arc 3 shavers still runs like a champ after years of use and abuse. While it can’t hold a decent charge anymore, it works flawlessly. In my opinion durability is one of the strongest assets of a Panasonic shaver, regardless if it’s an Arc 3, 4 or 5. The materials used are of high quality and everything looks and feels extremely solid. For an entry-level shaver, the build quality of the Arc 3 shavers is excellent. In my opinion it’s even better compared to Braun’s Series 3, their direct competitor in this segment. 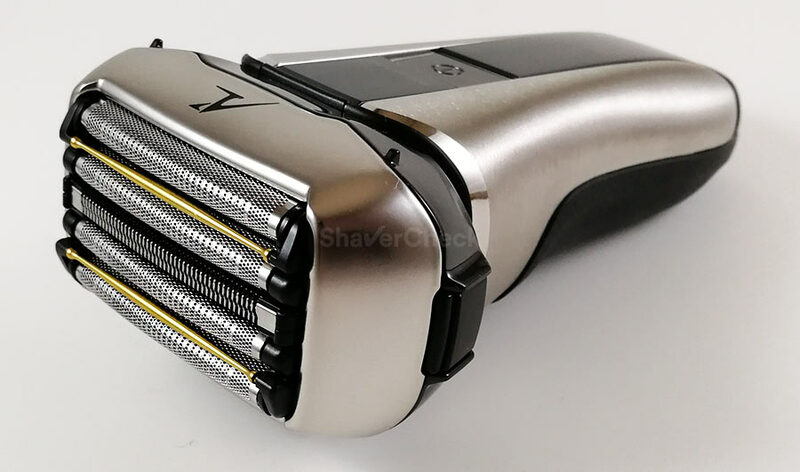 As for the latest LT models, they are in a different league; some even feature a metal body and they resemble a whole lot more the newest Arc 5 than previous Arc 3 shavers. The Arc 4 shavers can look a bit dated today as Panasonic never released any updates to this line. 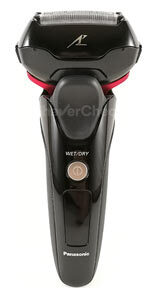 The Arc 5 shavers have seen improvements in the build quality with every new update. The first generation was very similar to the Arc 4 in terms of build quality and design — not a bad thing to start at all. The second generation Arc 5 was more adventurous with the design while the materials looked and felt more premium. 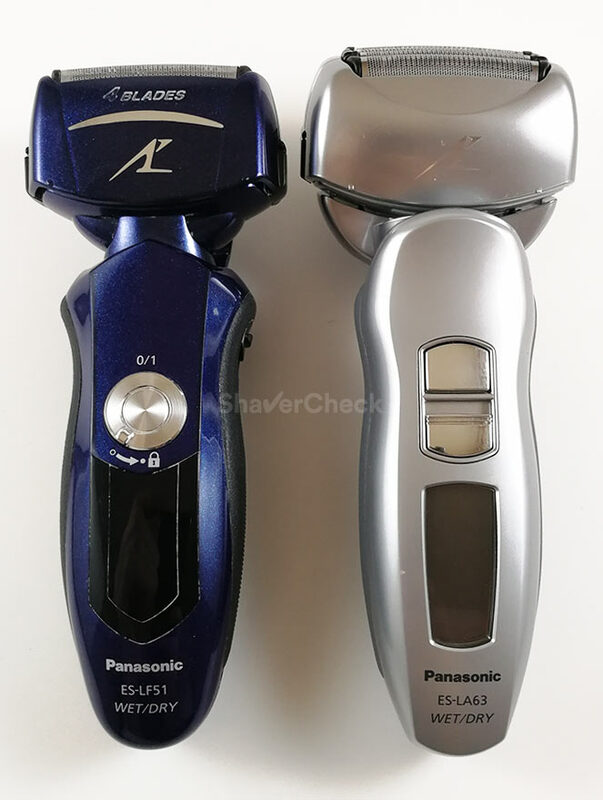 For the third update of the Arc 5, Panasonic upped their game considerably and went for metal on several models instead of plastic for the shaver’s body. The result is impressive, these models being the new benchmark in terms of design and build quality. Braun should really take some notes about how a high-end shaver should look. For the price you’re paying, plastic with a high gloss chrome finish simply won’t cut it. Let’s now see how the Arc models fare in the ergonomics department. Unsurprisingly, the Arc 3 feels the most nimble out of all due to the compact size of the shaving head. With one or two additional blades on the Arc 4 and 5 respectively, the shaving heads are massive and harder to maneuver when shaving tricky areas, like below the nose or around your sideburns. One thing worth noting is that the shaving head of the latest generation Arc 3 LT models is noticeably larger compared to the older ones. The implementation of the pop-up trimmer is consistent throughout all the Arc shavers. The cutter is located on the back and sits perpendicularly to the shaver when deployed. On older models the trimmer is positioned lower on the shaving head is unfortunate as you can’t really see what you’re doing and the bulky head gets in the way. One way to get around this problem is to remove the foils and the blades before using the trimmer. Things are better with the second and third generation Arc 5 models. Despite the 5 blades, the shaving head is not that tall and the trimmer is positioned pretty close towards the top. While you can’t use the trimmer for anything else besides touch-ups and light grooming, it works really well. The trimmers on Panasonic shavers are very sharp and cut hairs efficiently. For trimming your entire beard you should definitely use a regular hair trimmer. To sum it up: the Panasonic Arc 3, Arc 4 and Arc 5 shavers have excellent build quality, especially when considering the price category for each one. The latest Arc 3 and Arc 5 models are a definite improvement in the selection of materials, but they also come at a higher price. If you want a completely fuss-free shaving experience, an automatic cleaning station can help you achieve precisely that. The Panasonic Arc 3, Arc 4 and Arc 5 shavers offer variations that include a cleaning station. These stations will clean, dry, lubricate and charge your shaver automatically after every use. 1. The older Vortex Hydra Systems. These stations are available with the first generation Arc 3 shavers like the ES-LT71-S, the first generation Arc 5 shavers (ES-LV81-K) and the Arc 4 shavers (ES-LA93-K). They use the older WES035P detergent cartridges. The older cleaning stations are quite large and take up a lot of space on your countertop. Moreover, they are a bit noisy and can sometimes leak. The design is also starting to show its age. 2. The newer premium cleaning stations. These updated models are available with the latest generation Arc 3 LT models (ES-LT7N-S), second generation Arc 5 (ES-LV95-S) and third generation Arc 5 (ES-LV9N, ES-LV9A/B etc). They use concentrated detergent packets instead of cartridges that must be mixed with water in the station’s tray. These updated models are more compact, quieter and the leaking problem was addressed entirely. Panasonic stations use detergent for cleaning the shaver, unlike Braun which uses an alcohol-based solution. The use of detergent is very economical and the costs associated with using the stations are reasonable. Unlike alcohol, a detergent-based solution won’t evaporate and Panasonic’s cleaning solutions last longer before needing to be replaced. 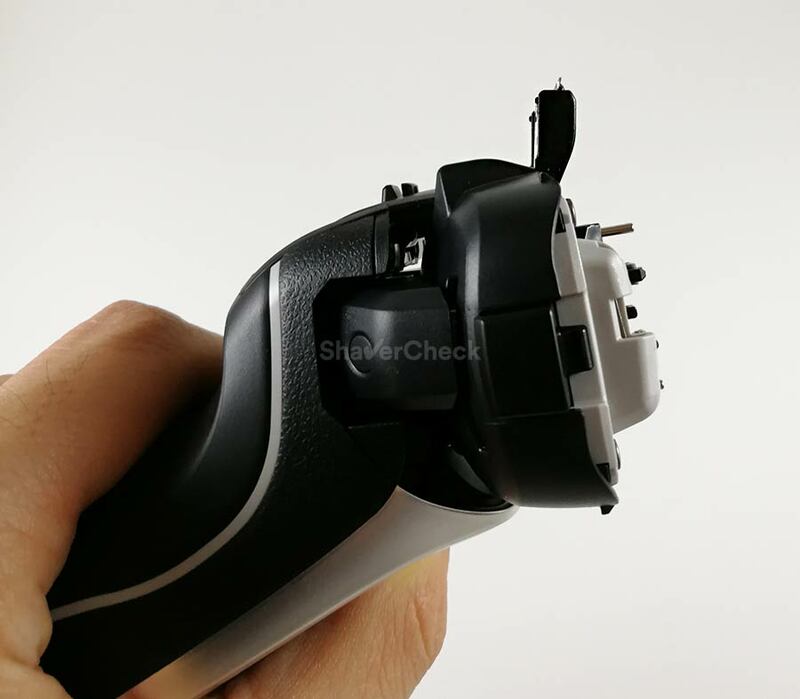 Another advantage of Panasonic’s cleaning stations compared to the ones from Braun is that you can use them without any restrictions when cleaning your shaver. For example, if you use shaving cream or gel you’ll have to manually clean any traces of foam in the case of a Braun shaver before using the station, rendering it pretty much useless for wet shaving. With Panasonic you can simply toss it into the station without any worries that the lather might clog it, although it would be recommended to give it a quick rinse. The cleaning cycles are relatively short (10 minutes), while the drying cycles take just over one hour. The result is a perfectly clean, dry, lubricated and fully charged razor, ready for the next shave. You can also just dry the shaver without going through a complete cleaning cycle, which is again something you cannot do with Braun or Philips stations. So far everything points in favor of getting a cleaning station as well. And if you don’t mind paying more for one than you should by all means get it. 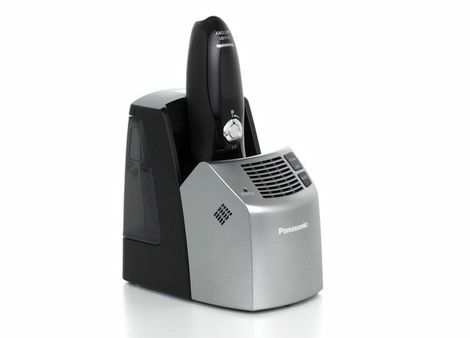 However, as I said in my comparison of the best cleaning stations, you don’t really need one with a Panasonic shaver. Foil shavers are generally easy to clean manually and Panasonics are the best in this regard as the blades and foils can be taken apart. 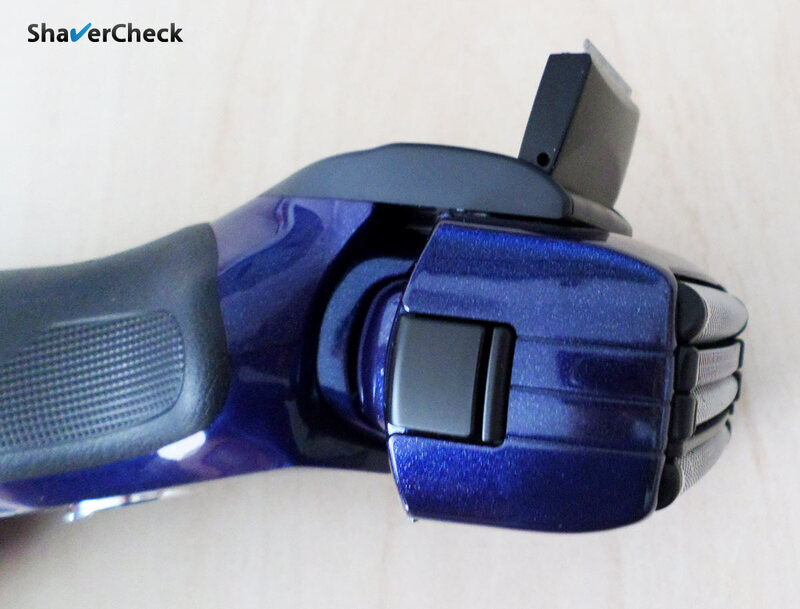 Thoroughly cleaning your Panasonic shaver manually is a breeze and it literally takes less than a minute. A bit of liquid soap and a thorough rinse with warm tap water is all it takes. Moreover, Panasonic includes a so-called sonic cleaning mode with all the Arc shavers, even the entry level Arc 3. When activated by a long press of the ON/OFF button, the blades will oscillate extremely fast for around 20 seconds, dislodging any stubborn debris. For the Arc 3, you should skip it completely. The models that come with one cost significantly more than the ones that don’t and they’re dead easy to clean manually. Not to mention that the Arc 3 is an entry-level line and paying a premium price doesn’t really make sense. For the Arc 4, you should skip it completely. The older Vortex Hydra system is the only one available with the ES-LA93-K and as we saw it has some downsides. Moreover, the Arc 4 shavers that don’t include it, like the ES-LA63-S or ES-LF51-S usually cost a lot less. For the first generation Arc 5 models, you should probably skip it. The reasons are the same as in the case of the Arc 4 above. For the second and third generations Arc 5 (ES-LV95-S, ES-LV9N-S/ES-LV9A-S) that have the updated station, you can get it if it fits within your budget. Finally, if you can find a great deal for any Arc shaver and the price difference compared to the corresponding model that doesn’t include the station is minimal, then definitely go for it. Some may disagree, but I consider value for money to be just as important as the performance when it comes to buying an electric shaver. Getting more performance for less money just seems very appealing to me. There are three things we’re interested in. The first generation Arc 3 shavers like the ES8103S or ES-LT41-K are generally the least expensive of them all. However, some Arc 4 models like the ES8243A or the ES-LA63-S can be found for just a few bucks more. For this you get an extra blade, more power on some models (14 000 CPM vs 13 000 CPM) and a more advanced shaving head. In my opinion the Arc 4 models currently offer the best value for money as their price has dropped significantly since their introduction. The same can be said about the first and second generation Arc 5 which are in my opinion just Arc 4 shavers with an extra blade. The performance is similar, with a slight edge for the Arc 5 as the larger shaving head means faster shaving times. The original Arc 5 like the ES-LV61-A can sometimes be found at excellent discounts and when that’s the case they can still be a perfectly good option despite their age. Like I said in the previous section, I would personally skip the cleaning station (included with the ES-LV81-K). However, the ES-LV65-S and ES-LV95-S from the second generation Arc 5 are a better choice if we consider their price, performance and build quality. They’re a clear improvement over the first generation for usually a similar or lower price, so definitely do some research before making your purchase. The most recent shavers from the Arc 3 line (like the ES-LT3N-K or the ES-LT7N-S) are pretty expensive, even though the improvements in design and particularly build quality are significant compared to the older shavers. The same goes for the ES-LV6N and ES-LV9N from the Arc 5 line that have (at least at the moment of writing this post) a prohibitive price. Apart from the initial investment, you will need to replace the foils and blades of your Panasonic shaver. How often largely depends on your shaving habits, the coarseness of your beard and how well you take care of your razor. Usually the more complex a shaving head, the pricier the replacement parts will be. And this is pretty much the case with the Arc 3, 4 and 5. The replacement foils and blades combos for the first generation Arc 3 like the ES8103S, ES-LT41-K etc. are very reasonably priced (part number is WES9013PC). The parts used by the newer LT models like the ES-LT3N-S are different and more expensive (WES9015P). Moving on to the Arc 4 shavers we also see a bump in the price of the foils and blades (WES9025PC) that can cost almost twice as much as the ones for the original Arc 3. The first and second generation Arc 5 use the same foils and blades (WES9032P), thus the similar shaving performance. Regarding the price, it is higher than the ones for the Arc 4 line, but not by a whole lot. The third generation Arc 5 uses different parts (WES9034P) and they are usually expensive. You can easily see that as we move from the original Arc 3 toward the latest Arc 5 the price of the replacement parts goes up significantly. The Arc 3 and Arc 4 currently have the lowest costs of ownership. From this analysis, I wanted to emphasize the importance of researching the price of the replacement parts as they can increase your running costs significantly. The initial purchase price is just one side of the problem. As it was the case with the Arc 4, the prices of newly released models from the Arc 3 and 5 lines will eventually drop; same goes for the replacement parts. But at this moment they’re not worth buying as the price difference compared to the previous models is simply too high. Finally, we have the detergent cartridges or sachets needed for the automatic cleaning stations. As mentioned previously, the older Vortex Hydra stations use cartridges containing a detergent based solution, while the newer stations use concentrated detergent gel that comes in small packets and must be mixed with water in the station’s tray. The price of the detergent, particularly for the cartridges, is actually reasonable when compared to the offerings of other manufacturers like Braun. Depending on how often you’ll be using the station, you can get away with replacing the detergent every two to three months. Using the station once or twice a week for example would be a very good compromise that’ll minimize your costs. This results in a low cost of ownership if you decide to opt for a model that comes with a cleaning station. All the stations use the same cartridges or detergent packs, so there’s no difference in the costs regardless if you have a Panasonic Arc 3, Arc 4 or Arc 5. The automatic cleaning station is excellent, but as I already said, it is not really necessary and it’s up to you to decide if you should get it or not. The whole purpose of this comparison was to make it easier for you to choose a Panasonic shaver that would suit you the best. Everyone’s needs are different and what may be the best shaver for someone won’t necessarily correspond to your requirements. Things like price, cost of ownership, performance, coarseness of your beard and so on can tip the scales in favor of a different shaver. By this point you should hopefully have a preference toward one of the three families of Panasonic shavers discussed here. Here is a quick actionable summary of our Panasonic Arc 3 vs Arc 4 vs Arc 5 comparison. You have a limited budget and want the best bang for your buck. The first generation Arc 3 shavers (for example, the ES8103S or ES-LT41-K) are probably the best option. You shave daily or every other day at most. Less advanced electric shavers work best when used on short hair. If you have a light to medium growth you can get away with shaving less often. For coarse facial hair, the Arc 3 is still suitable if you shave daily. You are a beginner and this is your first electric shaver. The Arc 3 is the most simple and easy to use due to the compact shaving head, so at least in theory you should get used to it pretty quickly. You want the closest shaving entry-level electric shaver. And with the Arc 3, Panasonic is arguably the best in this category. Its closest competitor, the Series 3 from Braun, falls a bit behind in terms of closeness. You’re mostly interested in getting a very close shave without paying the premium price of (some) Arc 5 models. You have coarse facial hair. You shave daily or every other day. Depending on how fast your hair grows, you can get perfectly good results when shaving every two days. You want very fast shaving sessions. The 4 cutting elements + a powerful 14 000 CPM motor found on most models (the ES8243A uses a 13 000 CPM unit) will ensure a very fast and efficient shave. The ES-LA63-S/ES-LF51-A would be my personal picks. You have somewhat sensitive skin. I find Arc 4 shavers to be a bit gentler to the skin compared to the Arc 3. Shaving cream, pre-shave lotion and lubricating the cutting parts on a regular basis will also improve the comfort and can make them suitable for irritation prone skin. If you have very sensitive skin then you’ll probably be better off with a Braun Series 5 or Series 7. You want what is likely the closest shaving electric shaver you can currently buy. I’m referring particularly to the second and third generation Arc 5 shavers. You have very coarse facial hair and want the fastest possible shave. The massive shaving head + the powerful motor will give you precisely that. You don’t mind paying more for the shaver and replacement parts to get slightly better performance compared to the Arc 4 models. You want an automatic cleaning station with your Panasonic shaver. The station included with the second and third generation Arc 5 is better than the previous one that’s available with the Arc 4 ES-LA93-K. My personal pick would be the ES-LV95-S as it offers the best value for money. You have somewhat sensitive skin. The second and particularly the third generation Arc 5 represent an improvement over the previous versions in terms of comfort. However, the third generation Arc 5 shavers are still very expensive. If you have very sensitive skin the Braun Series 9 will probably be a better option. I’ve said it on many occasions that I consider Panasonic shavers to be some of the best you can currently buy. And as we’ve seen in this post, there are a lot of situations where they would make perfectly good choices. However, here are a few cases where other shavers would probably be better. You have very sensitive skin. 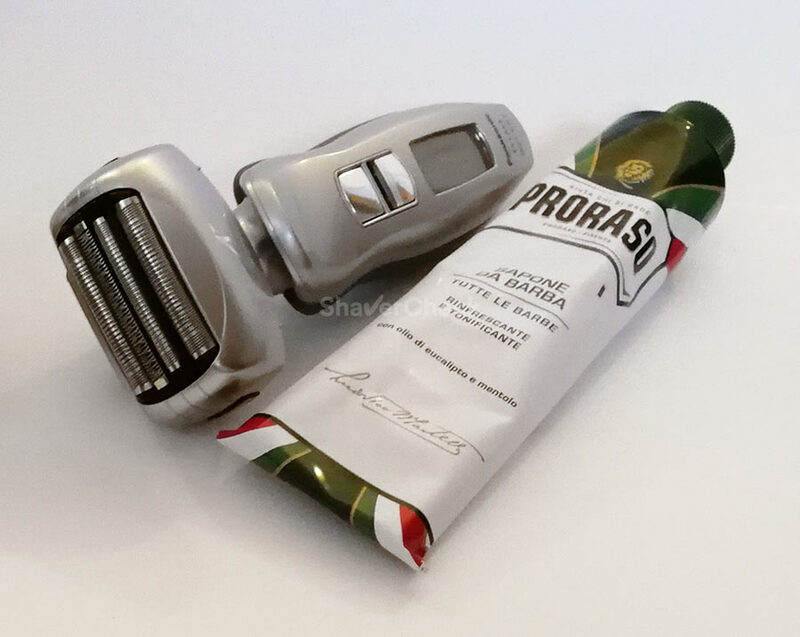 While Panasonic razors can be adequately comfortable, especially if you implement the recommendations in this post, Braun shavers are superior out of the box when it comes to comfort. Depending on your budget and how often you shave, a Braun Series 3, 5, 7 or 9 can be a better alternative. You have wiry, flat-lying hairs that grow in different directions. This is particularly troublesome if you don’t shave daily and most foil shavers will struggle to catch all the hairs efficiently. If this sounds like you, then a Braun Series 9 or even a rotary shaver should be considered. This pretty much wraps up our overview of Panasonic shavers. I will update this guide as new models are being released to keep it relevant. If you have any other questions, make sure to post them in the comments below. Home » Articles & Guides » Head to head » Panasonic Arc 3 vs Arc 4 vs Arc 5: Which One Should You Buy? Thanks so much for this very thorough article! I was leaning toward an Arc 5, but now I think I’ll try to find a good deal on an Arc 4. FYI, I’m in Canada, and Panasonic seems to be seriously gouging us. The ES-LV65-S retails at $199 USD, which is $242 CAD as of this writing. Believe it or not, the damn thing lists for $419 up here! A 73% markup! Will probably end up buying from the US like I do with lots of other things. Thank you for your comment and kind words. I’m glad to know you found the article useful. $419 is simply outrageous for an ES-LV65-S. I live in Europe and it’s the same situation here. Just to give you an example, I’ve seen a Braun Series 9 9290cc listed for $570. As a result I buy most of my review units from the US as well. Even with the shipping and customs fees the final price is still significantly lower than what I would pay if I were to buy them from here. I hope you’ll enjoy your new shaver, the Arc 4 from Panasonic is an excellent line of shavers and in my opinion a very underrated one. I own quite a few shavers but the Arc 4 is actually the one I use the most. I have both the Arc 3 and Arc 4, along with what you might call a medium density beard and shave daily. Both were bought on Amazon in January of 2018 with one used in an upstairs bathroom and one downstairs. Frankly, I find the Arc 4 to not only be noticeably faster, but far more comfortable with less irritation. Fwiw, the additional amount paid was well worth it and will eventually replace the Arc 3 with at least a 4 bladed model. Btw, thx for the reviews, I’ve found them very helpful. Thank you for your comment. All Arc 4 models are great performers which is something that can’t really be said about the Arc 3 — the ones with the more powerful motors will be significantly better than the rest. You didn’t mention the model of your Arc 3 shaver, so this could be one of the reasons behind the unsatisfactory results. I know you prefer the ES-LA63-S over the ES-LF51-A but I think I would prefer the ES-LF51-A due to its more compact size, particularly the shaving head. If both the Arc 3 ES-LT3N-K and the Arc 4 ES-LF51-A were the same price, which would be the better razor? I have a light to medium beard and shave daily. By the way, I haven’t found anyone else on the web who comes close to your reviews and articles. Outstanding, thanks. I usually recommend the ES-LA63-S over the ES-LF51-A because it offers better value for money. Well, most of the time it does. But I fully agree that its head is unnecessary large — side by side with the ES-LF51-A the actual area of the foils is pretty much the same, but the whole shaving head of the ES-LA63-S is very bulbous. Regarding the ES-LT3N-K vs ES-LF51-A, that’s really a tough one. Both would be suitable for your beard type and shaving frequency. I am actually waiting for an ES-LT3N-K to arrive (hopefully next week) and I’ll be able to give you a real feedback. I do suspect its performance to be very similar to the ES-LF51-A (they use the same inner blades and the motors are again similar) or even slightly better, particularly the comfort during a dry shave. As soon as I get it I will reply to this comment and share some first impressions. I live in Europe and ordering anything from the USA takes a long time to get here, so I’m really sorry that I won’t be able to do it sooner. I shave once in 2/3 days and have sensitive skin. About a couple of years back, in my attempt to switch to electric shaver, I tried Philips Norelco (rotary shaver – cant recall the model) for about a month – It was causing irritation and razor bumps so I stopped using it. 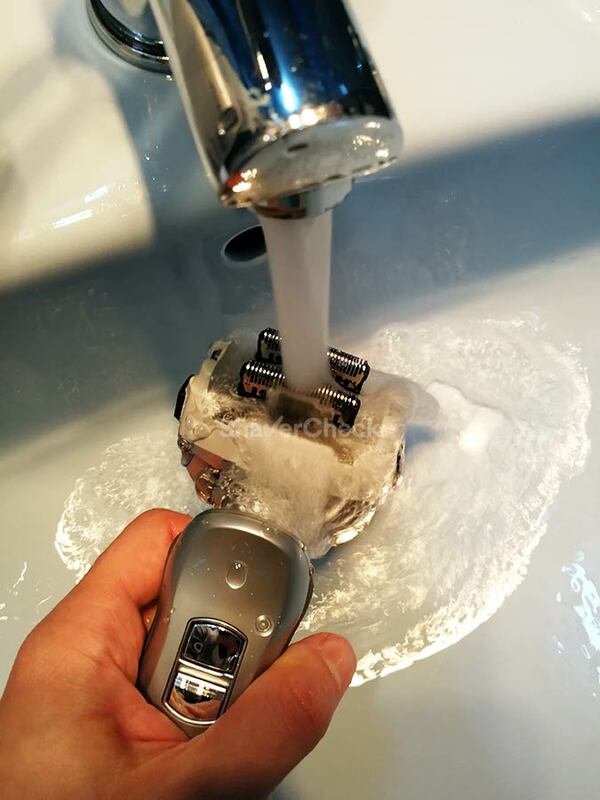 Now again I want to give a try to electric shavers – hoping foil shavers will do the trick! Since, I’m still in the switching phase I don’t want to go for a very high end model. I note your preference for Arc4 ESLA63-S but based on the articles it looks like the size of the head is quite big. Does the size make it difficult to shave in tricky areas (under the nose, closer to the lips)? Do the benefits of ESLA63-S over ES-8243A outweigh the issue with head size? As a reference – Even with 4 blades is it bigger than Arc5 ES-LV65-S model? Whats your suggestion based on my situation? I’m happy to look at other models. Thanks for your help. I tend to recommend the ES-LA63-S over other Arc 4 models because of its price; it usually costs a lot less than other models with similar performance. The size of the head is its only serious drawback; the problem is that the head partially obscures the area that you’re shaving since it ‘s taller and wider than the 4 cutting elements. For me this is more noticeable when shaving under the nose or right below the jawline. I got used to it, but I can see this being a problem for someone using a foil shaver for the first time. 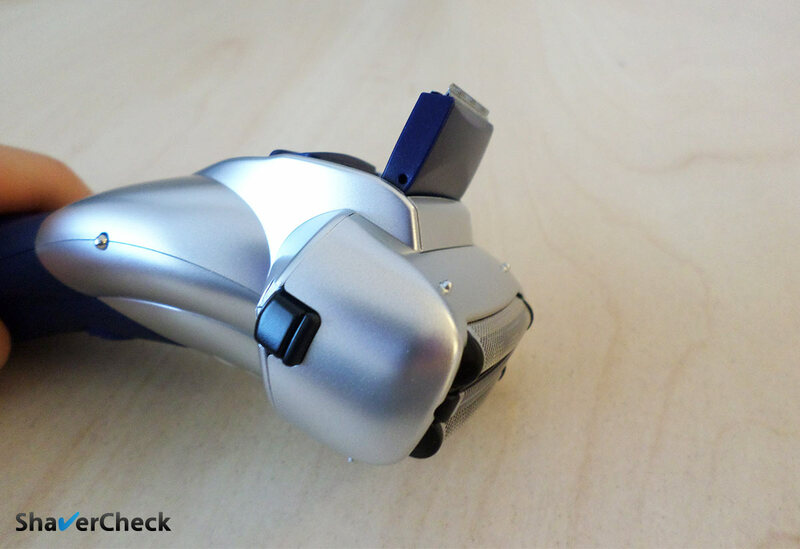 Overall it feels similar in its proportions to the ES-LV65-S that has 5 blades. For this reason I would actually be inclined to recommend you the ES-8243A or the ES-LF51-A if you can find a good deal on them. The ES-LF51-A feels a lot nimbler than the ES-LA63-S despite having the same number of blades. It is a really good shaver and that one would actually be my default recommendation for an Arc 4 (if it would cost less than the ES-LA63-S). Whichever you end up buying, I would also get a spray lubricant & cleaner like the Remington Shaver Saver. That one works wonders with Panasonic shavers since they’re a bit more aggressive than Braun shavers and need proper lubrication to stay cool and comfortable. It will also prolong the lifespan of the blades. Which one do you recommend between ES-LT41K Arc3 ($72) vs ES-8243A Arc4 ($104)? I notice that both are 13000 cpm. 1) Is the size of the ES-LT41K head smaller than Arc4? – easier to shave under the nose? 2) And is there noticeable difference between shaving closeness due to the additional blade in Arc4? Any other relevant difference between the two? I came across another Arc3 model (13000 cpm) – ES-RT51S? Not sure why is it priced much lower than others ($43). You are very welcome, TJ. Regarding your question, the answer is yes, the ES-LT41-K has a smaller head and it’s easier to shave under the nose. However, the ES8243A is quite manageable for a 4 blade shaver, definitely better than the ES-LA63-S for example. I find the size less of an issue with this one because the head is actually as wide and as tall as the surface of the foils. I hope this makes sense. I didn’t find it to shave closer than the Arc 3, but it takes me less time to complete a shave and it is slightly more comfortable. If you have the budget for an Arc 4 I would also recommend you to check out the ES-LF51-A, it can usually be bought for a similar price. The ES-RT51-S is an older model that precedes the Arc 3 line (it doesn’t have an arched foil block) and it is fitted with a less powerful motor (10 000 CPM). In my opinion the ES-LT41-K is superior. 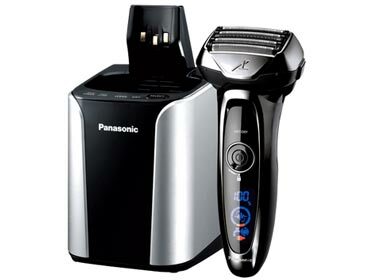 I have tried a Panasonic arc 3 Rt47 and enjoyed the close shave and aggressive and nimble feel of the shaver, but found it to be a little under-powered compared to an arc 5. What I didn’t care for as much was the large shaving head of the arc 5. So I am considering a newer arc 3 with at least the 13,000rpm motor, or an arc 4 (preferably one with a smaller shaving head size). But I know that you like the 63 series arc 4 a lot, with it’s multi-flex head and dual motor (is the shaving head as large as an arc 5?) So I’m seeking your recommendations about which might be a best fit for me, not wanting to discount features the 63 series has if you feel they are important. I’m not sure how coarse my beard is… call it medium coarse (? ), and I shave most days, very occasionally I’ll skip a day. I like the idea of cost-efficiency, and would prefer a shaver that’s not too expensive to maintain, all else being equal. Incidentally… Great job, really enjoy your insights. Thank you for your comment. I actually recommend the ES-LA63-S over other Arc 4 models mainly because of its price. Yes, it does have the more advanced flexing head and a second motor, but this shouldn’t prevent you from choosing other models that would be more suitable in your case. And the thing is that its shaving head is quite large and for someone who prefers a more nimble shaver this could be a problem. It actually feels pretty similar to An Arc 5 in terms of proportions. The ES-LF51-A is in my opinion just as good performance-wise, but its head is significantly smaller and more maneuverable — I own both and the difference is noticeable. So the ES-LF51-A is worth considering in my opinion if you decide to buy an Arc 4. You will definitely notice a difference going from 10 000 CPM to 13 000 or 14 000 CPM, so even if you get an Arc 3 (ES8103S, ES-LT41-K) you’ll still be getting a substantial update. If you’re looking for the more cost-effective option, the Arc 3 is the way to go, especially since you’ve been quite happy with your older ES-RT47 (minus the speed). I would recommend against getting the very latest Arc 3 — I’m currently testing the ES-LT3N-K and its head is unnecessarily large (not that obvious from the official images), it costs more and doesn’t shave a lot better than the previous models. So stick to an older 13 000 CPM Arc 3 like the ones mentioned previously. Here is the complete review of the Panasonic ES-LT3N-K. Hope it’s not too late, but it took a bit more than I anticipated. Hi Ovidiu… great job with this website. Thanks. Last month, I believed that Arc5 (second generation) was my perfect choice. However, the price it is expensive for me (146 U$). Honestly, I do not understand the differences between them. Which one do you recommend me? Strictly between the two, I would go for the ES-LF51-A. It’s slightly more powerful (14 000 vs 13 000 CPM) and it costs less. Other than that they are pretty similar with regards to performance and cost of ownership. Do you know if the new Arc5 WES9034P foil (with the gold-color rollers/strips) and the old WES9032P foil are interchangeable? I’ve noticed the blades are the same part # WES9170P. I’ve the old Arc5 ES-LV65-S and wonder if I can put in the WES9034P foil for an upgrade! That is correct, the inner blades of the new Arc 5 are the exact same ones used in the previous generations. While I haven’t tried it myself, the new WES9034P foil should fit the ES-LV65-S. Panasonic won’t list it as a compatible model for obvious reasons. 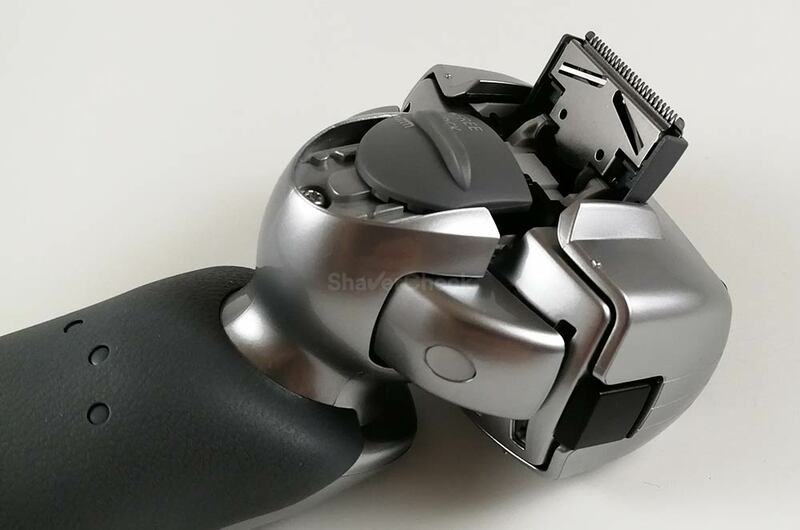 You should however take extra care whenever trying any parts that are not (officially) compatible with your shaver. Amazon has the Panasonic ES-LA63-S for $127.66, and they have the ES-LA93-K for $110 (on sale). These appear to be the same razor, but the LA-93-K has a cleaning/charging station (and is less expensive). Are they the same? Yes, the two shavers are identical except for the color. In this case the ES-LA93-K is definitely the one to buy as it comes with the automatic cleaning station. Do you think any of these models would be better than the others for shaving women’s legs, or would a different brand/model work better? Women’s electric shavers aren’t dual voltage, which I need for travel. Thanks! While I cannot speak from experience (for obvious reasons), a basic electric shaver like the Panasonic Arc 3 or Braun Series 3 should work. The hair on the legs is much thinner than a man’s facial hair, so there’s no need for an advanced/powerful shaver. However, do keep in mind that electric shavres work best on short hair, so only consider one if you’ll be using it more often. Thanks for the great thorough article! Just what I was looking for to weed through the different models and options. I have a ten year old Arc-3 ES8109. Still works great but does not hold a charge. I am thinking of upgrading to a new Arc-3 or -4. Do you know if the newer models will fit into the older Charging/Cleaning station I have? Mostly concerned with charging. Thank you for your comment. The newer models will not work with your existing station. I also cannot recommend the new Arc 3 as I wasn’t satisfied with the shaving performance and it’s still quite pricey. In my opinion the Arc 4 ES-LA93-K is worth checking out if you want a shaver that also comes with a cleaning station; it’s a great shaver and it can now be found at an excellent price. Would you recommend ES-RT47-S over ES-RT17K ARC3? Yes, the battery life of the ES-RT17K is quite poor and when the charge drops below 30% or so you’ll also experience a drop in performance. The ES-RT47-S has a much bigger battery with more than twice the capacity. I think this an important aspect since these shavers can only be operated cordless. Otherwise they’re very similar and even use the exact same foils and blades. Nice review. I noticed on a recent top list the Remington F5-5800 Foil Shaver is also mentioned. So between that and the Panasonics ES-LA63-S & the ES-LA93-K – which is the loudest? I have a Braun 9 with a cleaning system and both the Braun & its cleaning system are quite loud. So my next shaver may just be just the shaver. Thx much. Thank you for your comment, I really appreciate it. If you’re looking for a quiet foil shaver, unfortunately you’ll have a tough time finding one. The Panasonic ES-LA63/ES-LA93-K are actually a bit louder compared to the Series 9, at least to my ears. They are fitted with a very powerful motor and during use they produce a high pitched whine (that gets louder when cutting the hairs). The Braun Series 9 is buzzier and the sound has a lower frequency which to me sounds just a bit quieter. So in this regard the Panasonic won’t be an improvement. The same goes for the Remington F5-5800 (and in terms of performance, it is clearly inferior to the ES-LA63-S and the Series 9). 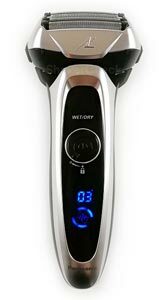 Rotary shavers are a lot quieter but do come with their own specific limitations (more details here). If a quiet operation is very important, you may consider getting one if you think it’s a worthy trade-off. After reading your articles which electric shaver I should go for and have narrowed it down to two (was considering braun 9290 and the newest 7 series as well). Thank you very much for this. I prefer to wet shave when I can. Currently using a DE but jump on an old Norelco when I am in a rush or feeling a bit lazy that day. I don’t prefer using my Norelco as it achieves a far inferior shave to my DE. Hopefully foils are actually better and achieve close to the same results as DE razors. Would it be better to have the cleaning station with the ES-LV95-S ARC5 currently $149.99 or skip it and go with the Arc4 ES-LA63-S at a much lower price $86? TYIA. It should come down to your budget. The ES-LA63-S costs a lot less, but in terms of shaving performance, it’s actually pretty close to the Arc 5. The ES-LV95-S is a bit more comfortable and shaves a bit closer, but that’s about it. My pick would be the ES-LV65-S if you can find a great deal on it (it’s basically the ES-LV95-S minus the cleaning station — you don’t really need it). Otherwise I think you can confidently go with the ES-LA63-S. Which is the better buy? ES-LA63-S ($90) or ES-LV95-S ARC5 (149.99). Is the arc5 that much better for the extra cost and the convenience of the cleaning and charging station? Strictly between those two models and considering the prices you’ve mentioned, I would go for the ES-LA63-S. I don’t consider Panasonic stations to be necessary. The Arc 5 is a bit more comfortable and shaves a bit closer, but that’s pretty much it. The differences aren’t huge by any means. Sometimes you can find the ES-LV65-S (basically an ES-LV95-S minus the cleaning base) for a similar price to the ES-LA63-S — that one would be the best pick in my opinion. 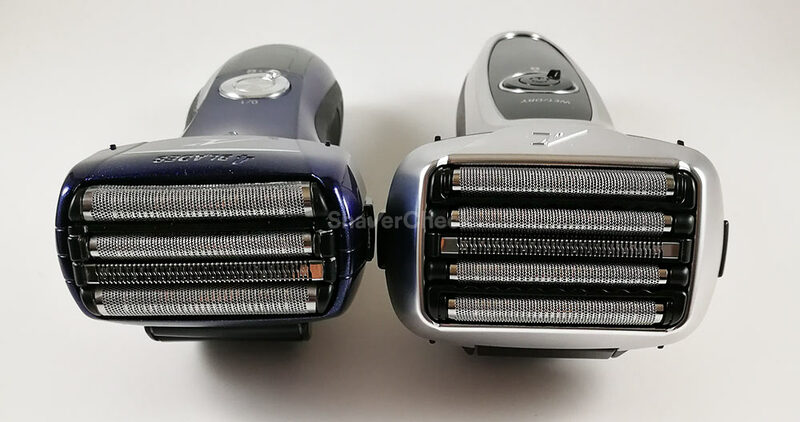 But strictly between the shavers in your comment, I think the ES-LA63-S would still offer excellent performance and for less money. Your BEST advice in the article is to check the prices on “blade replacements”, before deciding on which model to buy. I bought the third generation Arc 5 (ES-LV9N), it was $300 with the cleaning station, there was another version that was the same razor, only without the cleaning station, but I could not find it anywhere, and this was about only a year or so after these ARC-5 razors came out. I didn’t want or need a cleaning station as I only wet shave in the shower, and could have saved $50. I’ve been happy with the performance of this razor, and simply use the station as a charger stand. Now the bad part, blades should be replaced every 12-18 months, depending on use of course. You can tell when you have to push a bit harder and see a bit more “pink” rash in those areas on your face, and more occasional hair “pulling”. My 1.5 year old blades are in this state, so I began looking online for a replacement “set”. 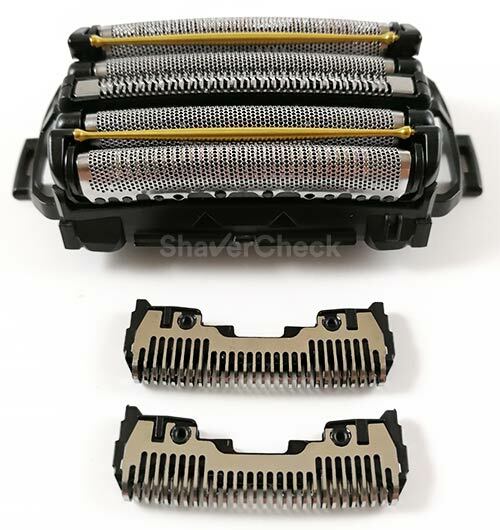 This is the model set: “Replacement Men’s 5-Blade Shaver Foil and Blade Set – WES9034P”, these are the ones with the 2 “gold” comfort bars on top. Google returns a small amount of online store links, and few if any actually have them, those pages simply say “out of stock”, or “discontinued”. So it’s almost Impossible to price shop and find any discounts, almost as if Panasonic wants to be the only ones that sell these replacements? They are listed on the official Panasonic sites, usually listed as “out of stock”. Their list price: $120.00 US. As you also wrote, as much or more then some of the earlier razors themselves! Wish I had researched this aspect beforehand. I can justify the high original cost, as it’s a good, close shaver, but the unavailability and crazy high cost of replacement blades, make one feel like I’m just “renting” this shaver. Live and learn, and BTW, very well written article! Thank you for your comment, I really appreciate it. You are right, some of the replacement foils and blades are sold at an outrageous price. In this situation, if you cannot find the exact part (WES9034P) at a reasonable price, one solution would be to get the foils and blades used by the previous generation Arc 5 (the part number is WES9032). They usually cost less than half the price of the newer set and will fit your ES-LV9N perfectly. Performance-wise, they shave just as close, but aren’t quite as comfortable. Anyway, it’s nothing too serious. Lastly, you could try to revive your current foils and blades with a spray cleaner. I use the Remington Shaver Saver on my older Panasonic shavers that don’t cut like they used to and also cause me that nasty pink rash you mentioned; the results are pretty impressive. I cannot guarantee that it will be the same in your case (you will need to replace the blades eventually), but maybe it’s worth giving it a shot. Great article. I am considering the Panasonic ES-LA63-S Arc 4 all based upon the articles you have written about it. Also you state it is your personal favorite. I currently own a very old Braun Series 7 ( replacement foil is part 7000 ). At one point it had a cleaning station but that busted a while ago. I still use the razor. I have replaced the foil and cutters afew times now. One thing I like about my old Braun is that I can shave with it while it is plugged in to charge ( my batteries do not hold a good charge any longer ). So being able to use the Braun as a corded razor works for me. I have a question about the Panasonic ES-LA63-S Arc 4, if needed can I use it as a corded razor ( not is a wet situation )? To me this is a good feature to have on a razor being able to use corded. In your opinion should I concede to a new razor ( my Braun is many, many, many years old but still running ) OR continue to purchase replacement heads and foils every 2 or so years for the Braun I have. There are a few things about the ES-LA63-S you should keep in mind if you decide to make the switch. First of all, you cannot use it corded. It will only work cordless (as all current wet/dry shavers). 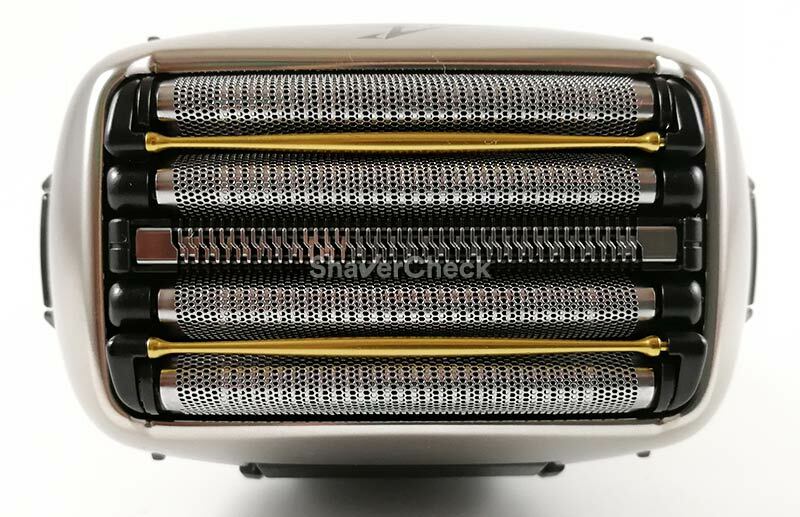 Secondly, its shaving head is noticeably larger than the one of your Series 7000, so it will take some getting used to. I haven’t got the chance to use the original Series 7, but the ES-LA63-S should be noticeably faster and it should provide a closer shave. But these are very subjective considerations and the context is also important. 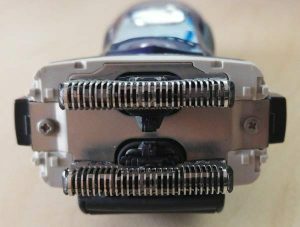 For example, if you are satisfied with the shaving performance of your current shaver and you can get away with buying new parts every two years (that’s excellent btw), I don’t really see the need to upgrade, at least not for now. Congratulations for this great information site on razors. I have been following you for a few years. It’s a pleasure to see reviews and tests, and comments from readers. I hesitated for a long time before upgrading to Arc 5 Panasonic. I had a Panasonic Arc4 LA-93 that gave me satisfaction for years. But the Lv9q is the best razor I’ve had. It supplants the LA-93 at the level of its softness. And it’s not a placebo effect. The grip is exceptional. Shave softer, much softer! Faster too. Even with a beard of 3 to 5 days, the razor is powerful and does not tear the hair. Arc4 too, except at 5 days when some hairs are torn off. But it depends on our beards, more or less thick. This is exceptional 5D head! The razor follows the contours of the face as I have never seen. The comfort of shaving is really improved. The neck is a little less problematic than Arc4, but you have to come back anyway for some recalcitrant hairs. This remains the limit of the Arc series, but with Arc4 I had to use the mower much more than Arc5 for the neck. Now, for the quality of shaving, I had nothing wrong with Arc 4. But it takes more time, and slightly less soft (it’s still very good, but we feel the difference of generation). I do not regret my upgrade. It’s a pleasure to shave with Arc5. If you have the budget, go for Lv9Q! But, as already said here, the La-63 and 93 are still there and very good. Just a little less soft, less fast, less comfortable (for 5 minutes a day, it does not matter). Thank you for your kind comment and for being a reader of this website for such a long time. I really appreciate it! Your feedback on the new Arc 5 is excellent and I’m sure it’ll be helpful to any potential buyers, so thank you again for taking the time to share your experience with the community. If your son suffers from acne I would actually suggest you to consider a Braun shaver instead. They are gentler, more forgiving and better suited for sensitive skin. Depending on your budget, you can opt for a Series 3 or a Series 5. I would suggest the Series 5 as it’s a better shaver overall, but if it’s out of your budget then the Series 3 is probably the best for this in the entry-level category. The Series 3 ProSkin 3010s and 3040s are usually priced the lowest. I’ve enjoyed your informed commentary but now find myself in a quandary. Several years ago I bought what was touted as the best shaver out there, the Panasonic, and at the time the current model was the ES-LA63. It’s served me well but with the battery showing signs of petering out and the cost of new foil and blades I’m wondering whether it’s replacement time. I was accustomed to a Norelco and flirted with wet shaving with my Panasonic but decided to stay dry. Now I find that by oiling my blades weekly and using a good pre-shave, shaving is more comfortable but getting the gunk out of the blades is tedious. Now for the first time I can see where a cleaning unit with a shaver could be advantageous. Any thoughts? BTW, I have a pretty coarse beard and am in a position where I don’t have to shave every morning … Thanks. Thank you for your comment. 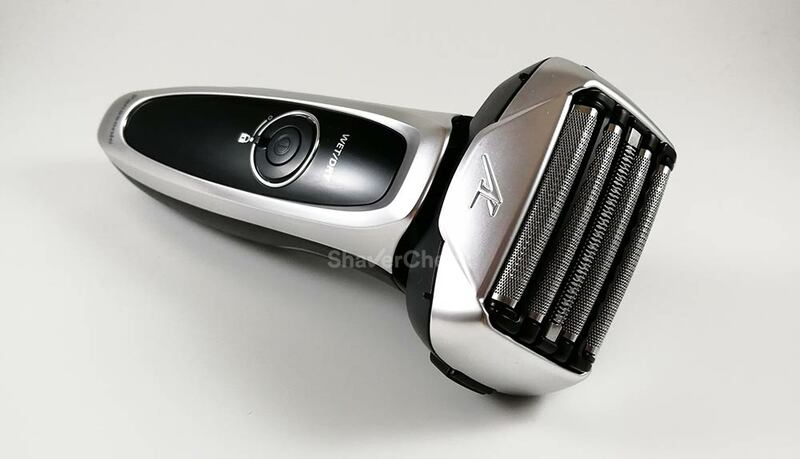 First of all, the issue of the pricey replacement foils & blades will continue if you decide to buy a new Panasonic shaver and the more complex they are, the higher the price. For example, an Arc 4 set is more expensive than an Arc 3 set and the Arc 5 with its 5 blades costs the most. And out of all shaver brands, Panasonic tends to have the most expensive parts, even though not by a lot. 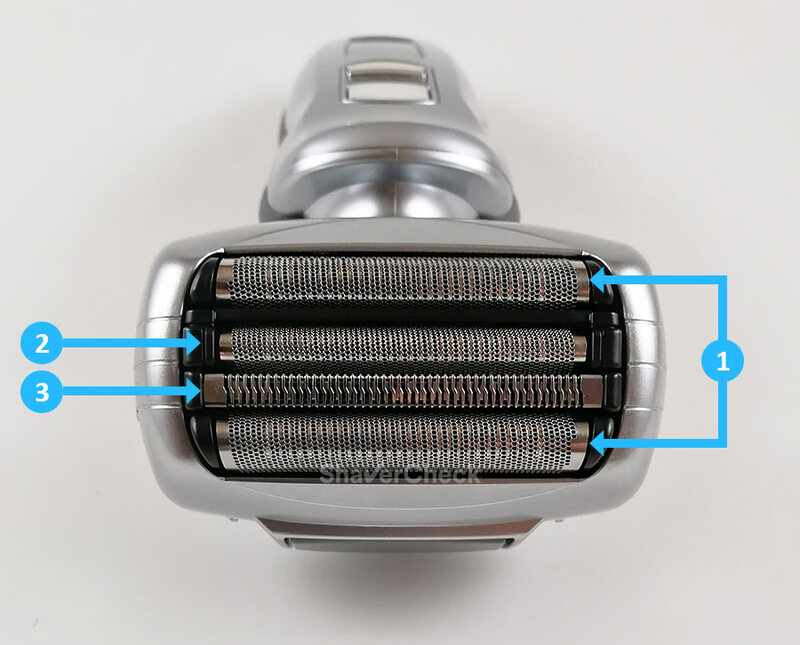 Since your shaver’s battery is starting to show signs of degradation, it makes sense to buy a new shaver instead of simply replacing the foils and blades. A cleaning station is an option as well, even though I wouldn’t consider them a must with Panasonic shavers. Cleaning the blades regularly with a bit of liquid soap and water should prevent gunk buildups. Also, a spray cleaner & lubricant works really well. If however you are decided to get a cleaning unit, the ES-LV95-S Arc 5 is probably the best option with regards to costs and performance. I would personally go for the cheaper ES-LV65-S and clean it and lubricate it myself. I think you should stick to Panasonic shavers especially since you were satisfied with the performance; unless you’ve tried a rotary before and know for a fact that you’ll get along with one, I wouldn’t recommend you to switch to a Norelco. In most cases an Arc 4 or Arc 5 will shave closer and with greater comfort. Great article with thorough comparisons! Which Panasonic ES would you recommend as a startup for an 18 years young teenager boy (out of the acne phase)? I’ve read your articles about Arc 4 and Arc 5 and seeking your input as to which one is the best as a starter ES. Looking for ease of use for him, near updated technology of ES, 3″nanoblades, 14000 circles/min, ease of use, easy to maintain, wet/dry operations and a quite motor. After reading the articles the top choices we have are Arc 4 series LA63s and LF51a, Arc 5 series LV65s. Last option would be Braun shavers (Have seen series 7 and series 9 at local Costco). Thank you for your comment, I really appreciate it. I would go with the ES-LF51-A, I think it would be a great choice for a teenager (excellent performance, easy to use due to the smaller head compared to an Arc 5 or other Arc 4 models, usually cheaper and easy to clean). As for noise level, they’re all pretty similar to my ear. A Series 7 would however be a better option for sensitive skin, including acne-like skin conditions. It is gentler to the skin compared to the Panny and more forgiving, especially when used dry.